Abderrahmane Sissako’s Timbuktu is Bertolt Brecht at the edge of the Sahara Desert, dialectical and enigmatic, full of subverted tensions and allegorical characters who are complicated by contradiction and shading—the kind of mature polemical filmmaking that can’t help but seem singular, because few political-issue-type directors try it, and even fewer get it right. On the most basic, parable-like level, it’s about a Muslim community being forcibly taken over by jihadist militants, and about a local cowherd being tried for accidentally killing a man in an argument. Sissako’s plotting is pure art theater—the opening images of local folk art being destroyed for target practice play as a wordless direct-address prologue—but his plunked-down, long-take style is almost documentary in the way it frames people talking, singing, and going about their business. 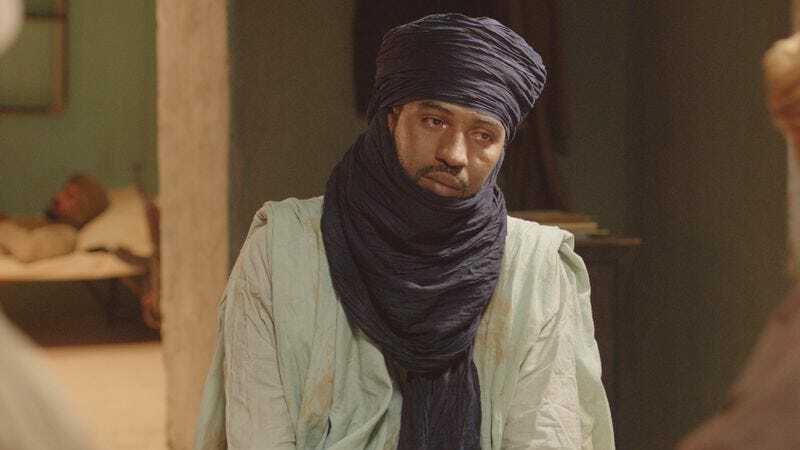 As in his previous feature, Bamako, this creates internal conflict between allegory and reality that the movie never really attempts to reconcile and doesn’t have to, because it brings to mind the real interaction of politics and everyday life. And the thing is, for much of its running time, Timbuktu is a wry comedy, with its militants—international recruits, recent converts—awkwardly attempting to control the town, interacting with the inhabitants through translators, trying to flirt with local women, sneaking cigarettes (forbidden), arguing about soccer (ditto), or, in an extended scene, trying and failing to record a video declaring their rejection of the Western values with which they were raised. It’s a familiar gag—even the zealots can’t live up to their laws—but Sissako keeps repeating it and building on it until it stops being funny and people start being stoned to death, buried up to their necks in the dirt. 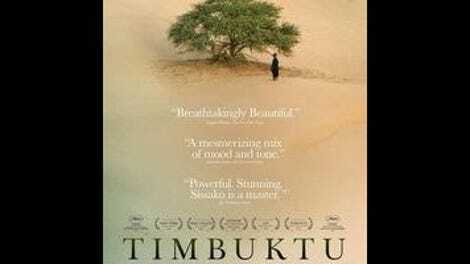 In essence, Timbuktu is about how farce turns into terror. The militants arrive in Timbuktu (actually Oualata, in Sissako’s homeland of Mauritania) to find a community that’s already populated by devout, by-the-book Muslims, leading them to issue increasingly severe edicts. (Cue a militant, sent out to make sure a ban on all music is being enforced, radioing his superior to ask, “They’re singing praise to the Lord and his prophet; should I arrest them?”) Sissako is constructing a commentary on jihadism in strictly Muslim terms, his point being that militant fundamentalism is about control—often subverted desire—and power, not religious principles. This idea gets its most affecting expression through the plight of the movie’s central figure, Kidane (the eminently likable Ibrahim Ahmed Dit Pino), the cowherd. Kidane makes the mistake of bringing a loaded gun to an argument with his neighbor—a sequence that climaxes with a wide shot framed around a shallow pond, the water serving as a giant mirror for Kidane’s action—and then submits himself to the consequences. In short, he plays by the rules, but is then denied any sense of dignity by the militant interlopers who oversee his trial and claim to share his values. Even from those who surrender themselves whole, something must be taken away.